Walk on the Wild Side with Everything But Water! Whether lounging poolside or with toes in the sand on the Naples’ beaches, be spotted in the season’s must-have print. Two words say it all: Luxe Leopard! 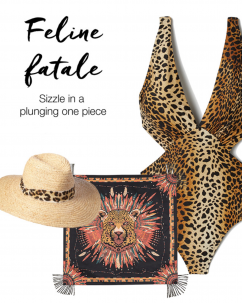 This season Everything But Water will have you walking on the wild side with their collection of leopard bathing suits, cover-ups, and accessories. The trend is so “spot on” that even the celebrities are rockin’ the look! (Click to shop Salma Hayek’s Melissa Odabash Plunge One Piece Swimsuit from Everything But Water). 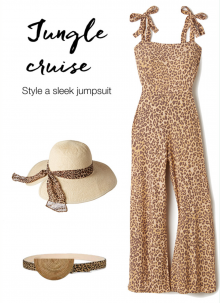 There is a leopard style bathing suit to flatter every figure. The collection incorporates many styles – one-piece, two-piece, cut outs, ruffles, plunge neck, one shoulder, triangle top, or the classic bikini. The popular print suits practically scream “pool day”! Cover-ups this fierce are impossible to pass up. Everything But Water’s leopard cover-ups and sundress lineup includes maxis, short dresses, rompers, pants, kimonos, tunics, and pareos. No outfit is complete without accessories. Sun hats, handbags, sandals, sunglasses…Everything But Water thought of it all. Each accessory has its own printed flare to complete the look. Wondering how to put it all together? Here is Everything But Water’s guide to pairing your prints.